In a rare response to the chatter about Apple’s tech feud with Adobe, Apple’s Steve Jobs has declared that that the Web should really embrace open standards, even while the iPhone remains closed. Jobs just had Apple publish his musings on Apple’s “hotnews” section. And it’s amazing. No, seriously, it’s amazing, not only for the frankness of the text, its overt challenge to Adobe’s reliability, but also for Steve’s stance on open versus closed tech standards. Though the letter’s titled “Thoughts on Flash,” its real thrust is how Web-connected technologies in the future really need to have openness at core. At this point, he partakes of some serious dissing of Adobe: Its products are “100% proprietary,” is the first jab, followed by gems like “Symantec recently highlighted Flash for having one of the worst security records in 2009. We also know first hand that Flash is the number one reason Macs crash,” (a fact made painfully clear to me this morning, when a crashed Flash plug-in killed an hour of my writing effort) and “Adobe publicly said that Flash would ship on a smartphone in early 2009, then the second half of 2009, then the first half of 2010, and now they say the second half of 2010. […] Who knows how it will perform?” Steve also brushes over the famous battery life issue, and, yes, that oddly over-looked issue of touch compatibility. Behind all this, though, is a different message: Apple is responsible for crafting open Web standards, that are good, as well as being future-friendly (mainly referencing webkit, of course.) 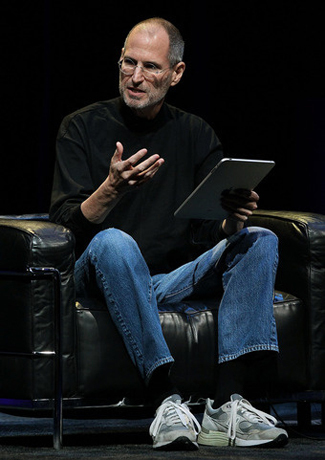 And while Apple’s platforms remain tightly closed, this is for a reason…and Steve thinks the post-PC era (seriously!) which is dominated by advanced mobile devices accessing the Net should be characterized by new “open Web standards.” HTML5 and such are the future, and the Flash Web should be left in the past. A slightly niche tech commentary? You bet. But this is Steve Jobs, folks, and when he takes time to speak out on matters like this, in an unexpectedly open style, the tech world, and thus the entire Internet will take note. A call and email seeking response from Adobe were not immediately returned.